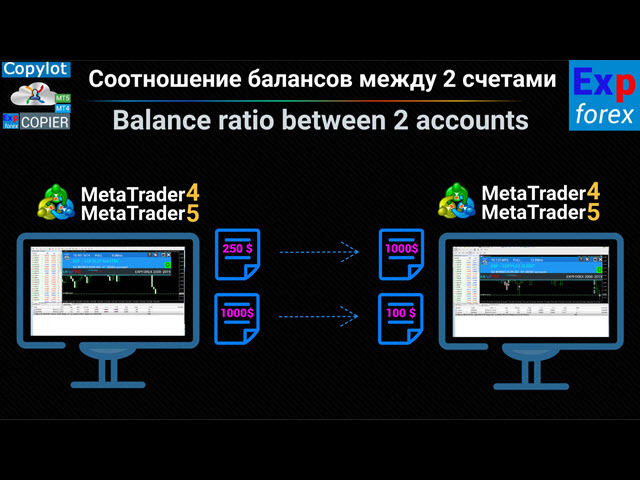 Exp5 - COPYLOT MASTER is a trade copier for МetaТrader 5 and MetaTrader 4. It copies Forex trades from any accounts. This Expert Advisor is a master copier. Install the Expert Advisor in the terminal from which you want to copy trades. Specify any text label name as pathWrite, for example, "COPY". Install COPYLOT MASTER for MT5 on the terminal from which you want to copy trades. Note: The list of settings can be found on the Comments tab. The EA needs to be set to 1 Chart! By default, our adviser copies all positions and orders from your account! Attention: copying of pending orders has been disabled for technical reasons! Orders are copied upon their activation (Positions) and copied to the client account. Partial closing is not supported! Orders can be closed only in the same lots as they were opened! If your master uses different lots for closing, then the copier may fail! It is one of the best MT5-to-MT4 trade copiers today. The unique copying algorithm exactly copies all trades from the master account to your client account. The product is also noted for its high operation speed Tough error handling. A powerful set of features. All these qualities are combined in a single program - EXP - COPYLOT. The program can be run on multiple terminal bindings. Use it as a synchronizer of your trades on various investor accounts trading on one account, - COPYLOT will copy your trades to other terminals. Beta testing: Added the ability to copy pending orders (PendingOrdersCopy ). Note: Pending orders can be copied only from an account HEDGE. Note: PendingOrdersCopy is disabled by default! If you find an error, please let us know in the discussion section with the attachment of full log files and a description of your actions. Fixed an error in display of the information on the chart. Optimized the operation with timer. If the timer cannot be started, the tickwise operation starts. Otherwise, the timer is used. Modified the copier for working on hedging accounts. Added the OnTimer event handler which increases the stability and copying speed. Fixed changing of the EA settings on the fly. Now the EA settings can be changed on the chart, without the need to restart the EA. Added a table of the current trades on the chart.